Home » cash » Food n Beverage » lucky » lucky draw » purchase » spend » Peraduan F&N Sejuta Kemeriahan Contest: Up to RM1,000,000 million to be won! 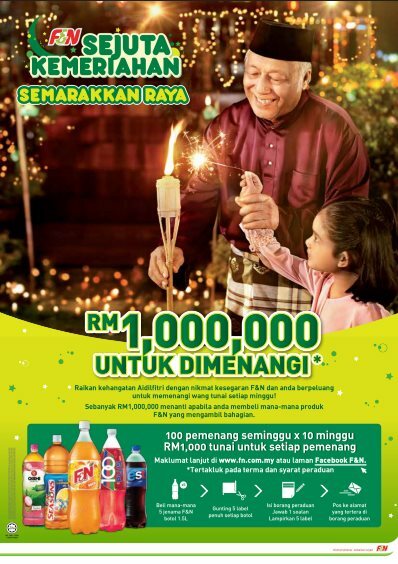 Peraduan F&N Sejuta Kemeriahan Contest: Up to RM1,000,000 million to be won! Buy 5 bottles of any 1.5l F&N brand. Cut out the full label of the 5 bottles. Fill up the Contest Form, answer 1 question, attach the 5 cut-out labels, and mail all of them to the address written on the Contest Form. Visit Peraduan F&N Sejuta Kemeriahan Contest Form for more details.